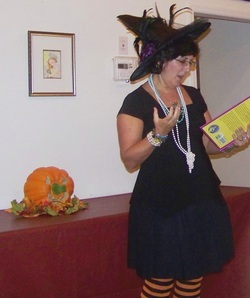 Readings & Interviews - HILDA McGILDA, "The Witch Who Was Too Pretty"
business groups and local civic organizations. 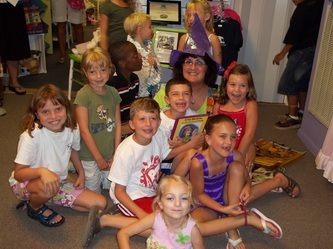 What a magical way to spend a great summer night, sharing Hilda McGilda's story with these wonderful children (and their adults!). At first some were afraid of witches, and most thought witches were scary. 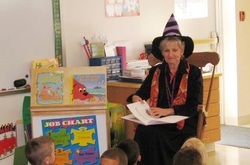 But thanks to Hilda McGilda, they now know that witches are great fun! 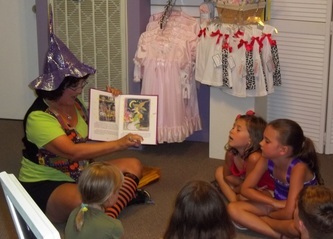 They helped perform the spells, and were amazed when the spells backfired and poor Hilda grew prettier and prettier. "Oh no!" they cried. "Will Hilda have to stay a mortal and live in town and never ever practice magic again?" As you can see from their big smiles, they loved how everything worked out in the end, thanks to Hilda's friends and the power of perfume! Thanks so very much, Susan & Anne, and thank you Little Friends! Thank you both for allowing me to be a very peripheral part of your wonderful book. Michele, the kids were enthralled by you and your enthusiastic reading of the book. I do believe the characters came alive for them. Lois, oh yes, the kids loved your great illustrations. I asked Michele if I could pretend to be you for the evening...that didn't go over well :-)...for just 1 night pleeeeeeeeeeease? Oh well! It was lots of fun being there, especially when the toddler with his blankie sat on my lap. Then, when he left, his sister took his place. You've both given these sweet children a wonderful gift of knowing Hilda McGilda! 200 kindergartners and first graders at Supply Elementary School! What a wonderful audience! They were thrilled that they could see all the pictures, thanks to our Power Point presentation, and I loved seeing their expressions as I read them the story that matched all Lois' marvelous illustrations. All of Hilda's colorful expressions cracked them and their teachers up: "Jumping Jehoshaphat!" "What in the moon?" "Ghastly horrors!" "Criminy!" Giggles galore! And their responses during the Q&A session that followed the story's end were priceless! "What happened to Hilda McGilda?" "She got too pretty!" "Really? How did that happen? "She drank Bubbling Brew and perfume!" "Oh my stars! What happened to her after she did that?" "She had to get married!" "She got married?" "Almost! But her friends saved her!" "Can you drink Bubbling Brew?" "No! No wa-a-ay!" I got so many hugs and thank yous for their spider rings - "They're just like Hilda McGilda's earrings! "- and coming to read to them, it was absolutely heartwarming. Thank you so much Dr. Willis, Ms. Woody, and Kindergarten & First Grade Teachers! I had done of Ariel, Spook's artist model. All the children loved hearing how I used my own cat to draw Spook." The boys loved Hilda. "They thought she was pretty ugly!" Lois laughs. "And they were flabbergasted when I told them Young Jim falls in love with her and wants to marry her!" 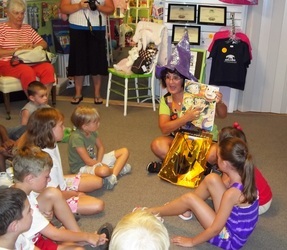 The children also delighted in Hilda's colorful expressions. "They would giggle everytime we said, 'Dumpy, frumpy, spunky' and 'Great balls of fire!' and 'Hullaballo!' together." One little girl was clearly inspired by Lois' artistic talent. "How did you ever manage to paint so many pictures in one day?" "She was relieved to hear that it took me lots longer than one day, and that I had the help of my very good friend, Michele Verhoosky, who wrote Hilda McGilda. Michele and I would sit together and talk about the characters and Hilda's cave, and Young Jim's store. 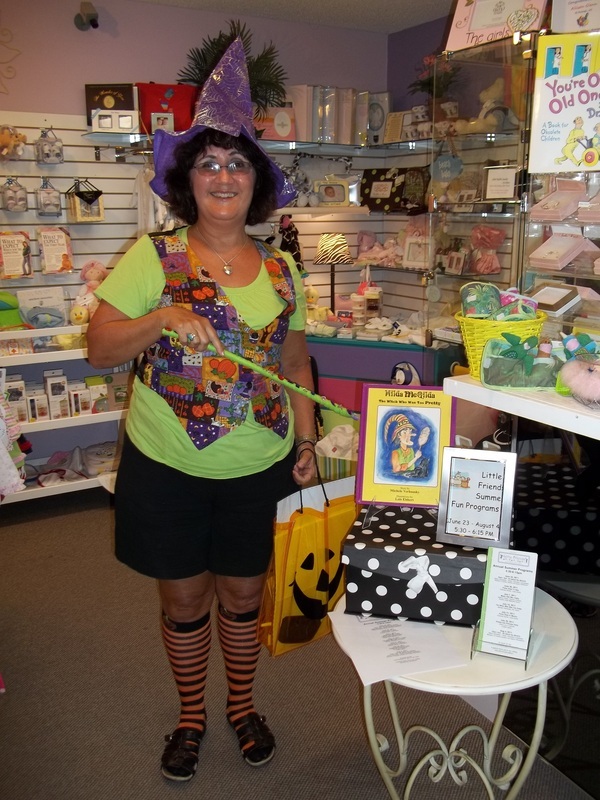 Michele would describe what it should look like and then I was able to draw and paint the pictures." 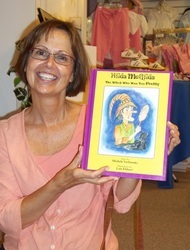 In addition to inspiring the children to write and illustrate their own stories in their journals Lois and Michele were most delighted to learn that the children "played Hilda McGilda" on the playground later that day during recess. Now that's truly delighting in Hilda's magic! Thank you Ebb Valley Elementary School! I think this is wonderful! I'm glad that NTD had a hand in helping through the Deaf Playwrights Conference. Congratulations and MUCH, MUCH success to you! Although you’d never know it from my current (married) last name, I was blessed to be born into a family of Irish storytellers. Growing up in Ohio, we’d make the yearly trek to New England to visit with our relatives who – with their South Boston/Quincy/Irish Catholic accents – I thought were magical. We’d sit in the kitchen, or on the front steps, and be royally entertained every night with the most marvelous stories and songs they’d weave out of thin air into wondrous tales of adventure that often featured us kids as the heroes. And then all us kids – brothers, sisters, cousins and friends – would spend hours the next day making up our own skits and decking ourselves out in clothes from the dress-up trunk so we could perform right back in search of applause. Applause was everything: love, acceptance, joy, exhilaration, and the encouragement to create again, and again, and again. Words, stories, songs were always around us. I remember there was some Storybook Theatre Radio Show that would come on, and especially remember “The Snow Queen.” My Grandma and Aunt Maureen and Aunt Carole would automatically fill in the gaps of what was being said for me. It was only later, when I turned 9 and finally had my first professional hearing test, that everyone realized how many of these words washing over me were simply washed away. I was half deaf! But like Beethoven (not to be vain here), my progressive deafness has actually proved a blessing. I’ve even been a church organist, which paid for the majority of my college education and a healthy portion of my children’s own. Music is just another language, another means for expression and telling a story. You feel it inside and see it in your mind’s eye in glorious color. Because I need to use my eyes so much I notice so much about people. There’s a wealth of insight contained in each expression, every gesture, every silence that speaks volumes about a person, about their character, their hopes/dreams/sorrows that I can so easily read. I love listening to people, and they love talking to me (whether in spoken word or sign language) because I give them my undivided attention. I have to; as a lip-reader I have no choice! Every person has a story, and all these stories are intertwined. That’s why I love dialogue so. I always hear it in my head. That’s why I’ve always told and written plays, stories, poetry, songs. Because in telling other people’s stories I’m learning my own. Hilda McGilda is being featured in two simultaneous art shows: The York Art Association (in York, Pennsylvania) and The Lockwood Folly Artists Fall Showing (in Lockwood Folly, North Carolina). Hilda’s illustrator, Lois Ebbert (my dearest friend and kindred spirit) won an award for her illustration of an alternate cover for Hilda McGilda. And I sold a matted and framed print of one of the Hilda McGilda illustrations right off the wall as I was hanging our Lockwood Folly display! I remember being fresh out of kindergarten in Ohio. Every couple of weeks The Bookmobile (a traveling library) would come to our street and the mothers would gather up their broods and we’d all flock to pick out an armload of books to tide us over for another two weeks. For some odd reason this time I was there by myself (my current baby sister or brother must have been home sleeping). Anyway, I remember the librarian, on learning I’d be going into 1st grade in the fall, telling me I was old enough to have my very own library card. I was in heaven. No, actually, I was beyond heaven! I literally floated home thinking I’d just received the keys to the kingdom. As I said earlier I was blessed to be born into a family of storytellers. My parents (wonderful storytellers, gifted musicians and community theatre actors in their own right) would read to us every night. And I would pour over my favorite books, picking out words, scrutinizing the illustrations and just sit down and start writing and drawing my own. If I didn’t know how to spell something – oh well, no worries – I’d just verbally fill in the blanks while “writing” elaborate curlicues on the paper. I adored paper and pencil, paper and pen, paper and crayons, paper and paint and finally, thrill of thrills, paper and typewriter and the ultimate paperless computer. I wrote stories all through school. I even won awards for some and got to read them at special assemblies and be written up in local papers, which I loved. Because, naturally, each of these stories would turn into mini plays and I’d perform all the roles myself! Growing up I’d sometimes be referred to as “Sarah Bernhardt,” which used to infuriate me. After years as a church organist I’ve gone on to study Eastern religions while earning my teaching certification in yoga, my Mastership in Reiki, and my introduction to metaphysics when I became certified in hypnotherapy and past life regression. So who knows? Maybe in a past life I was an actor, was a writer. I’m just thankful to been blessed with those gifts in this lifetime! Meeting Lois Ebbert. It was a moment preordained by karma, Kismet, Fate. Actually our husbands met first over golf. Both of them commented on how their wives should get together since they both liked art. I had Lois and Marty over for supper. Marty, a cancer survivor, was having a lot of back pain. Mike, my husband, said, “Why don’t you let Michele give you a Reiki healing session,” and then proceeded to give Marty a picture-perfect description of what Reiki is. Marty was overwhelmed and a more than a little “freaked,” but Lois was enthralled. We spent the next couple of hours delving into the depths of our shared interests while our ever so logically-minded darling husbands watched sports. We became instant friends, and discovered we were kindred spirits. For years Lois dreamt about being a children’s book illustrator. In fact, several judges would comment, as they awarded her entries prizes, “I’m so drawn to your color and whimsical style. 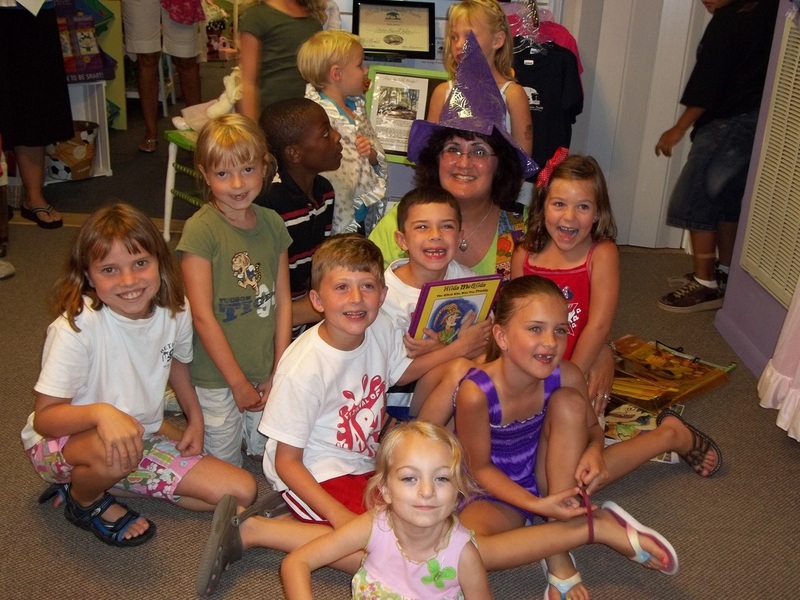 Have you ever considered doing children’s books?” I mentioned that I had an old story I had written for my children when they were growing up. This led to us discovering that we were both called, “Grammy” by our darling grandchildren. It had been years since my last play was produced. Though I kept sending things out to agents and theatre companies and magazines, I had hit the proverbial wall with production/publishing, and saw my secret dream of being interviewed by James Lipton on “Inside The Actors Studio” dwindling away. So in a “karmic moment of divine inspiration” Lois and I agreed to team up and put ourselves in “the hands of The Universe.” We initially were going to pursue traditional publication. But then, when Marty’s cancer returned and Lois nearly lost her own life in a freak fall down the stairs while at home, we felt a sense of urgency and looked into independent and POD publishing houses. It was important to us to do Hilda McGilda as a team so we could each of us help make the other’s dream come true and do so while everyone was still here to see the dream come to fruition. I don’t really concern myself overall with a style. I just listen to my character(s) and tell the story as it needs to be told. They basically write the story. If I become self-conscious and try to do things “right” and “by the book” they will very quickly—and quite vehemently--let me know they are not all pleased and stonewall me. So once I finally stop talking they take me by the hand, so to speak, and lead me home. So usually I write in dialogue, and usually there’s a lot of humor involved because life, even at its bleakest, is filled with humor. What do you feel are your “three” best writing tips? Listen! To other people. To silence. To those voices in your head. Look! Notice everything around you. Be still long enough to simply absorb and ponder and lose yourself in the moment, letting it carry you off or deep within. Open yourself up and let it all pour out without censoring yourself. That comes later—if at all—in the rewrites, the reworking. By doing all this I find that, for the most part, I get the gist of it right the first time. All the rest is just polishing and perfecting to the best of my ability at the moment. You don’t want to rework something to death, because then you risk losing what was true and magical about it in its genesis. Whatever incredible book I happen to chance upon. I love books, and love to—have to--read! If I don’t have a book or a magazine or a newspaper to read I will read cereal boxes, toothpaste cartons, road signs, anything! I have to read!!! plays were coming-of-age stories, some based on my own life experiences. I can so relate to Pat Conroy, and so look up to and admire him. romantic adventure. I especially enjoy her mystically slanted stories. Maeve Binchey—an outstanding Irish writer. Need I say more? Turning my attention to getting my earlier plays (excerpts of which have been published in various academic journals) published by French’s Plays. Nope! I love her pretty much just the way she is. If I could have revolving covers, then she’d be absolutely perfect! I loved working with Lois. Loved working on earlier versions with my son, Jason Verhoosky, from whom I learned so much about graphic design. And Lois and I both loved working with Randy Young of Sleepytown Press. The only thing I’d like to see is the cost of POD printing a hardcover book come more in line with the cost of POD printing a soft-cover book. This would greatly help book sales, and earn better royalties from online sales and through area bookstores. In my youth, thanks to being read to as a child. Hilda McGilda was a witch. A dumpy, frumpy, spunky old witch. Her ratty-tat hair was completely grey, her tattered robes patched, her warts on display. She had a long nose and snaggle-tooth teeth, the yellowiest color you ever did see. Among Dover Glen it was known she’d been a witch fifty years—multiplied then by ten! To me this says it all. Embrace yourself, stay true to yourself, and always be open to life and the moment. Not really. I just need to remember to stay out of my own way and let it happen! Who are your favorite authors and what is it that really strikes you about their work? They are the same writers I mentioned as my mentors. Dan Brown’s THE LOST SYMBOL, ANGELS & DEMONS, and THE DAVINCI CODE for attempting to open all of us up and get us to question and expand our beliefs and see that there’s always so much more to learn. Pat Conroy’s PRINCE OF TIDES, THE GREAT SANTINI, and SOUTH OF BROAD for showing us that oftentimes the deepest, most powerful journey any of us can ever hope to undertake is inside our own psyche, our own soul. What do you feel is the hardest thing for a writer? Well, it could be a hardship if you let it be, but Lois and I both kinda of actually embrace it and that is being looked upon at times as eccentric. I think that comes with living so much inside your head, because—for myself at least—that is where I hear my character(s) voice. The world of my imagination is rich, and full, and vibrant, and so very, vitally alive. In that world I hear/see/understand most everything. In the quote/unquote “real world” that’s not always the case since I’m sometimes at a severe disadvantage due to my hearing loss. Oh yes, tons! That’s one reason I so enjoyed tackling this joyful venture. I learned how to convey the images inside my own head to an illustrator (Lois) by breaking down the story into “scenes” much like a play. 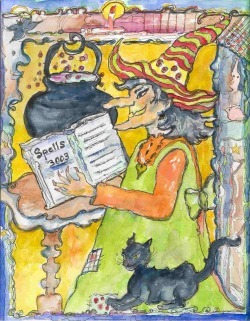 So, in my manuscript I would write, (1st illustration: See Hilda standing in her cave by her cauldron in colorful, tattered witchy finery, reading from page 3,003 of her spell-book while her black cat, Spook, looks on and interacts with her.) This was done for each and every one of the more than 32 illustrations. It freed Lois up to co-create right alongside me and bring Hilda’s world to glorious Technicolor life. I learned tons about graphic designing and overall book design. What could and couldn’t be done. I learned about how to find Design Fonts. About margins and gutters. Love what you do and do what you love. Your entire life is a story you are writing with each and every breath you take. Never give up. Whatever your dream, never give up. You may not be able to see your way past an obstacle now but if you stick with it you will see, looking back, that you were percolating. When you look back you realize that everything happens for a reason. If you stay present, stay open, you can take all those moments and string them together into perfect strands of heartbreaking/heart-warming stories.